Another awesome track update is here, this time an expert track called Drag Strip! The bloons have invaded the local monkey Drag Strip and are trying to stop the race, so don't let them get to the end and ruin everything. Careful placement and attention to tower ranges are essential on this short, two-path track. Check out the hilarious monkey dragsters in the background and pick up new medals and Awesome when you win. 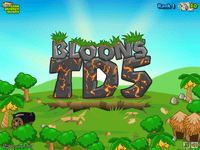 Bloons TD5 has heaps of new features including all of your favourite towers from BTD4 with 8 awesome upgrades each instead of 4, and two brand new never before seen tower types. So much new awesomeness: tower upgrades with cool Super Activated Abilities, new Bloon types, fun new tracks with moving parts and tunnels, powerful Special Agent towers, daily rewards, and daily challenges - a fun new challenge to play each and every day! Updates are coming all the time, and your progress is tracked for ranks, upgrades, and achievements when you log in using our new NK login system. Have fun!